Josh Carson is relishing another European adventure with Coleraine as they prepare to take on Serbian outfit Spartak Subotica. The midfielder made his debut for the Bannsiders in their 7-0 defeat in Haugesund last year, before they produced a much improved display in the goalless draw back at The Showgrounds a week later. Carson though is hoping they can keep the tie alive for the return leg this year. "It's always nice to play on the European stage, there's a few players who go through their careers and never get that opportunity, I'm thankful I've had it two years on the bounce now," said Carson. 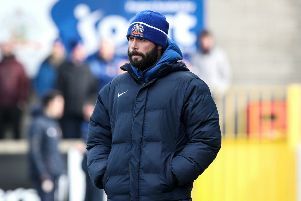 "It's important we go there and give a good account of ourselves and hopefully pick up a decent result, and then come back to The Showgrounds on the 19th and do it again. "We've done our homework on them, we've been on the internet to see what we can find out about them. "They've had a lot of top players who have come through their ranks in the past. "It's going to be a tough test for us, but we're not going to go in to totally oblivious to the challenge that awaits us." Captain Stephen O'Donnell also made his competitive debut for the club in Norway last year, and he believes they all have learned from that experience. “Having played last year as a group, we didn’t get the result we wanted but we learned a lot last year and I think that stood us in a good stead for the season," he said. "The lessons we learned about game management and how to play against quality opposition, this season is about showing ‘this is what we have learned from last season’, ‘this is how well we have improved as a team and as a group’ and for this European tie it’s about being competitive. “Last year we genuinely weren’t competitive, yes we lost to a better team, but this year it’s about trying to go one step better, be competitive and hopefully we can go out and do well on Thursday and bring it back to the Showgrounds for something to play. “If you want to be successful then these are the games you want to be involved in and yes it’s a different style of football completely. It’s a lot more technical than maybe the Irish League and it’s a lot more demanding in terms of your mental concentration, but it’s something we are looking forward too and Thursday night’s first leg tie is about showing what we have learned from last season. “We feel as a group and the quality we have in the changing room then we can genuinely can go and be competitive." Coleraine will have to do it without Manager Oran Kearney and his assistant Winkie Murphy, who both miss the game as they are on family holidays. John Gregg, the Bannsiders' head of youth development, will lead the side in Serbia, but Chairman Colin McKendry said Kearney has played a key role in the preparation and itinerary for the trip. "I'm not saying we won't miss him, of course, but the players have been very well prepared and know the plan," said McKendry. "John is our nominated Uefa Pro Licence coach for this match. "He has huge experience of the professional game and of the Irish League. "We don't know an awful lot about Spartak Subotica but we are looking forward to the game. "It will be a phenomenal experience for our young players and we are aiming to get a result that we can bring home."